The Pantheon MA700 antenna is an omni-directional heavy-duty, fully IP67 waterproof external M2M antenna for use in telematics, transportation and remote monitoring applications. The Pantheon series is designed for RF professionals who accept no performance compromises whatsoever. 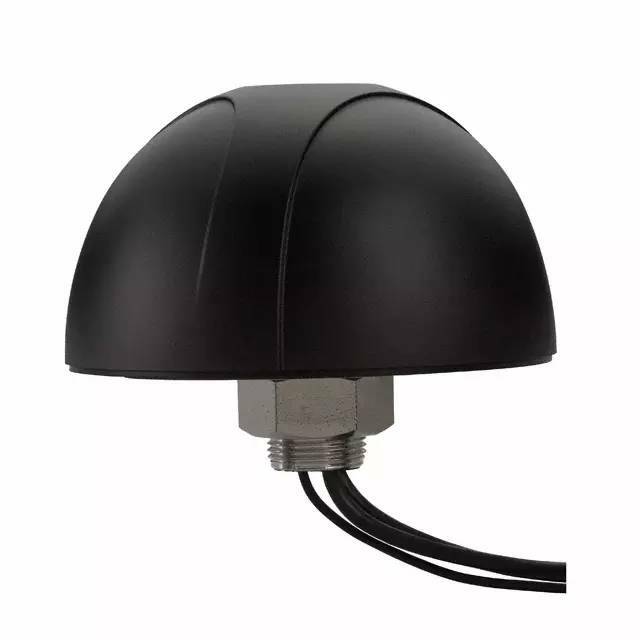 The MA700 combines a 3in1 GPS/GLONASS, Cellular 700MHz to 2200MHz (2G/3G/4G) and 2.4GHz/5GHz antenna with the highest efficiency and peak gain possible. Unlike our competitors who don�t measure cable loss the specification is measured at 3 meters (10ft) to show real performance in the field. The antenna screws down permanently onto a roof or metal panel and can be pole or wall-mounted. All while still maintaining 20dB isolation between antennas. It uses high-shielded PTFE dielectric ultra low-loss cables that maintain low attenuation at all frequency bands, and high noise rejection, with an average loss of only 0.3dB per meter (0.1dB per foot), compared to 0.7dB for RG58 and 1.2dB for RG174. Because of this, the Pantheon maximizes chances of passing PTCRB and network approvals first time. The Pantheon also has excellent performance without need to attach to an external ground-plane due to its internal antennas coupling to its unique super strong integrated metal base. The antenna comes with a 3M adhesive waterproof layer to prevent water leaking under the antenna into the mounting hole. The Pantheon can also be supplied in single GPS/GLONASS, Cellular, Wi-Fi only versions, or at other frequencies.